When training camp began back in early September, we ranked the top ten prospects in the Los Angeles Kings organization…and it’s that list that we’re using today as the template for the first Prospect Report of the new season. – Goalie Martin Jones: While many expect him to battle Jeff Zatkoff for playing time in Manchester (AHL) this season, he is the Monarchs starting goalie – for now. Per NHL rules, the Kings were allowed to take three goalies on their season opening trip to Europe. As such, Jones started both games over the weekend and posted a 1.52 goals-against average, giving up two goals on Friday and only one goal on Saturday. His save percentage sits at .940 for the moment. – Defenseman Jake Muzzin: He has not played since the first pre-season game of the year vs the Phoenix Coyotes. In that game, he was hit from behind by Mikkel Boedker (photo here) and has been suffering headaches and neck stiffness ever since. Last Thursday he was activated from the injured reserve list and loaned to Manchester, where his status for next weekend’s games remains TBD. – Forward Tyler Toffoli: Last week he was named the assistant captain of his junior team, the Ottawa 67’s (OHL). The player with the most goals in all of junior hockey last season (57), Toffoli has picked right up where he left off, scoring five goals in his first five games. The 67’s next play on Friday vs. Peterborough. – Forward Brandon Kozun: After the first pair of games in Manchester this season, Kozun has zero points, two shots on goal and is a minus-one. Expect more production in the weeks to come. This will be Kozun’s second year of pro hockey. – Forward Andrei Loktionov: He continues to shoot the puck in the early part of the season. Loktionov leads the Monarchs with six shots on goal after their first two games. He also leads the team in assists (three) and is has a plus-two rating. – Defenseman Slava Voynov: Along with Kyle Clifford, he was the only member of the Kings to play in all of the pre-season games. Voynov remained on the LA roster throughout training camp and was actually the final cut, made last Wednesday. Coach Terry Murray was very impressed with him during the pre-season and he’ll be watched closely this year in Manchester, where he should make his season debut on Friday. – Defenseman Nic Deslauriers: This season he moves up from the QMJHL (where he was the top defensemen in last year’s playoffs) to the AHL, where he made his pro debut on Friday. Deslauriers appears to be the real deal – a mix of offense, defense, good vision, smooth skating, smart play maker and a little bit of a nasty streak. For the last few years we’ve been singing his praises on MayorsManor and are looking for him to do big things this season with the Monarchs. – Defenseman Derek Forbort: Welcome to the club kid! Forbort scored his first college hockey goal over the weekend vs. Boston College. North Dakota eventually lost that game 6-2. Forbort also picked up an assist the night before in a win over Air Force. He’s partnered with Ben Blood (Ottawa Senators draft pick) as the top defensive pair and is expected to be selected to Team USA’s World Junior team this winter. – Defenseman Thomas Hickey: Life in Manchester continues for Hickey. He played well in the early part of camp with the Kings, but then was released back to the Monarchs. After the first two games of the year, he’s yet to record his first point. – Goalie Christopher Gibson: In six games played, he’s posted a 3.55 goals-against average and has a .886 save percentage. His 2-2-1-1- record may point more to the team in front of him. 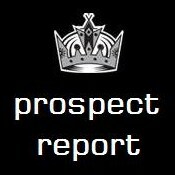 However, Gibson looks to be getting off to a shaky start this year, continuing what he showed in camp with the Kings. There will be extra pressure on the Kings top pick last June to deliver better results this season. Linden Vey (F) – Like Toffoli, he put up big junior numbers last season, winning the WHL scoring title. He now takes his talents to the AHL, where he’s posted zero points in his first two games. Can he repeat the success Kozun had last year in jumping from the WHL to Manchester? Maxim Kitsyn (LW) – He’s back to playing in Russia this year, after spending the second half of last season in the OHL. It’s possible Kitsyn will be back in North America next month – when Team Russia comes over to play the CHL in the six-game ‘Super Series.’ For now, Kitsyn has one goal and one assist in his first ten games in the KHL. JF Berube (G) – Started the season in Manchester as the temporary back-up to Jones. Now that Zatkoff has returned from his European vacation, Berube is expected to be in Ontario (ECHL) by the end of the week, and perhaps in the net for the team’s home opener on Friday. More on that in the days to come.